Our complaints are minor, and VolumeShaper 4 is already a go-to in our plugins folder. At this price, it's a winner. Excellent waveshape design and visual feedback. Multiband splitting. MIDI triggering. Cloud-based preset library. No manual. No scaling in displays. 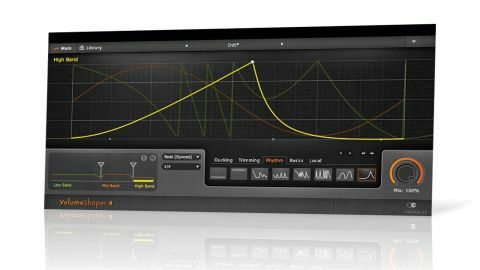 The latest release from German developer Cableguys is an LFO-driven volume modulation plugin that improves upon its v3 predecessor with multiband functionality, a simple spectrogram, online preset library, more preset waveshapes and a redesigned interface. At the bottom left of the GUI is the new Band Split display, wherein up to three frequency bands are defined for processing with their own LFO shapes. The slope of each crossover can be set to 6 or 12dB/octave, and the Zoom button expands the display to fill the whole interface. It's a simple but effective setup. "One of its most useful and successful applications is the creation of sidechain compression-style effects"
The majority of the action takes place in the Waveform display, in which you design your LFO shape by creating (up to 40) nodes and dragging them around, freely or snapped to the grid. An oscilloscope shows both input and output levels behind the LFO as a real-time audio waveform, making the accurate rhythmic positioning of peaks and troughs a doddle. Nodes can be shaped between soft and hard, and you can store up to six user waves per preset for instant recall. You also get a range of creative starting points and 'quick fix' preset shapes, as well as nudge left and right buttons, plus 'Randomize' and 'Mirror on X/Y-axis' options in the right-click menu. The LFO can sync to host tempo (1/128 to 32 bars) or run free (0.02Hz to 5.24kHz), with playback position either slaved to the host DAW or retriggered by MIDI note input. So what can you actually do with all this? Beyond the obvious 'trancegate' and rhythmic chopping effects, one of its most useful and successful applications is the creation of sidechain compression-style effects, with the Ducking preset wave selection giving six templates with which to start, and far more detailed shaping being possible than you'd get from a triggered compressor. The new multiband functionality means you can also tailor the ducking to occur only in a certain frequency range - in the bass, say. Beyond that, you've got frequency-based removal or isolation of hi-hats, kick drums, etc, (by setting the LFO cycle to 'grab' those target elements in a loop) and envelope shaping of single drums by MIDI-triggering the LFO in 1-Shot mode (shortening just the higher frequencies of a kick drum, say). VolumeShaper 4 is a potent tool for mixing and reshaping, then, and it makes easy certain tasks that could be fiddly and imprecise using other tools. On the creative front, plenty of fun's to be had cranking the LFO rate up to very high speeds, too, generating glitchtastic amp mod distortion across the whole signal or just specific frequency ranges. There are, of course, a few niggles. Although each of the three bands can be soloed by pressing its S button, the bypass switch is buried in the right-click menu - we'd prefer a button. Also, time and frequency scales in the waveform and Band Split display are notable by their absence (although a mouse-over tooltip on the Band Splits does at least reveal their frequency); and - as with all Cableguys plugins - there's no manual. It's not a difficult plugin to get to grips with by any means, but documentation is a must with any piece of software. Ultimately, VolumeShaper 4 is a versatile and powerful rhythm- and dynamics-manipulating tool at a very fair price.